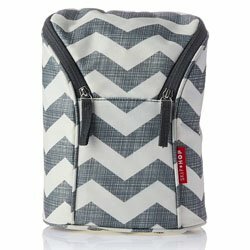 Best Baby Bottle Cooler Bags: Who Said Babies Can't Be Cool Too? If you don’t have children, or they are past the toddler stage, then you may be wondering what an article on the best baby bottle cooler bags is all about. In case you’re a parent, and your children are toddlers or younger, and you have never heard of these, then it’s about time you knew everything there is to know about them. 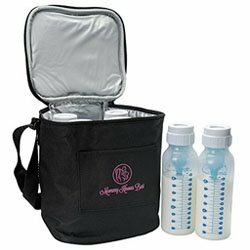 Baby bottle cooler bags are a very popular type of cooler bag that is capable of storing milk for up to a day in most cases. They can be used as every day coolers or for the specific purpose of storing milk. There are also options for those moms and dads that may want coolers that can store baby milk for longer. We tell you all about these options and give you tips on how you can best use them. If you have a child who’s toddler age or younger, then you definitely want to read this article. If you don’t then it might help to read it, so you’re informed in the future when you do have babies. • Perfect for secondary container to transport breast milk. • Includes 4 breast milk bottles with lids. Let’s start by pointing out that Medela is a well-known brand that is trusted by physicians as well as parents around the country. 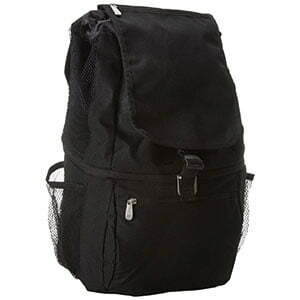 This particular cooler bag is a best seller and is of very high quality and also a bargain, given the price point. 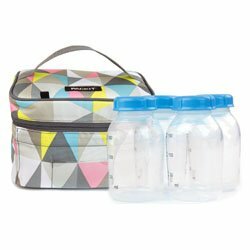 The cooler comes with a single contoured ice pack and 4 lidded breast milk bottles that you can use to store baby milk. 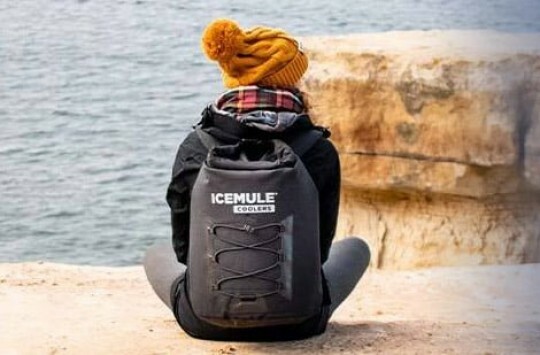 The ice pack is well designed to fit in the bag together with the bottles and will easily a minimum of 6 hours, given the insulation in the cooler bag. You can also buy extra ice packs separately if you need them. 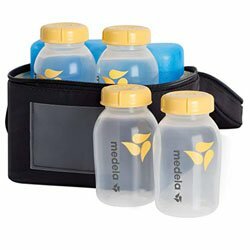 The Medela Breast Milk Cooler also fits well inside other Medela products, such as the Sonata, Pump in Style, and Freestyle breast pump bags, making it a convenient accessory to these other products. 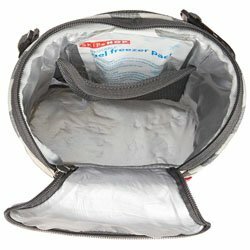 The cooler bag itself is PVC free and made out of microfiber material while the 5 oz. milk bottles are made of safe plastic. In case you’ve bought any Medela double electric breast pump, you may get this cooler bag for free. Otherwise, you can get it on Amazon right here. 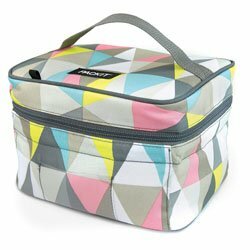 PackIt is another well-known brand whose claim to fame was the freezable lunchbox. Here they apply the same innovation to a baby bottle cooler, and it works like magic. Basically, with this cooler bag, you don’t need gel or ice packs in order to keep your bottles cool. The cooler bag is already packed with freezable gel, which is part of PackIt’s patented cooling technology. You just have to freeze the bag itself in a freezer overnight, and it’s ready for use the next day, capable of staying super cold for many hours on end. To freeze the cooler bag, all you have to do is fold the bag flat and store it in the freezer for a minimum of 12 hours. Storing it overnight will do. In the morning, the walls of the bag will be frozen and will remain so for several hours. Other features on this bag include a zip top that locks in the air in the bag and helps its insulation, a carrying handle, and safe materials for babies. 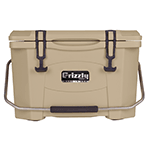 With a stunning, almost 5-star rating on Amazon, this cooler is definitely worth considering. 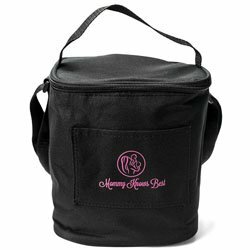 Mommy does indeed know best, and she knows that this particular baby bottle cooler bag is just about right for her baby’s needs. Let’s start at the fact this baby bottle cooler bag is pretty tall. It is capable of the tall 8 oz. baby bottles; six of them! That means it gives you the ability to store more milk for longer. This cooler bag, which you can see on Amazon right here, has pretty good insulation and maintains an airtight environment that keeps your baby’s milk at just the right temperature for hours on end. The construction is quite durable, and the lining is well insulated. The zipper is actually made out of reinforced steel and happens to be very strong and airtight, giving you the confidence you need to know that your baby bottles are as cool as they need to be on the go. 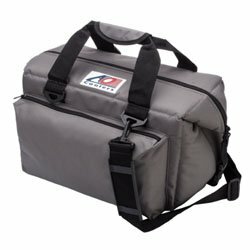 This cooler bag also features a shoulder strap for easy carrying and a front pocket where you can put any extras you’d like to have on the go. It also fits perfectly into the Medela Pump-in-Style carry bag. To start off, we love the sleek design on this particular cooler bag. The aesthetics are very appealing, and a lot of moms will be happy carrying this one around. 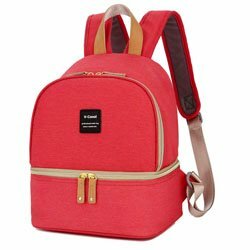 The design is also fine-tuned for portability, giving you the ability to carry the bag either by hand or on your shoulders conveniently and fashionably. We also love how light it is, even when full. 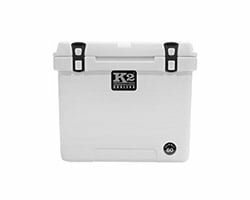 This cooler is actually multifunctional, just as you might have gleaned from the name. The top layer can be used as a lunchbox for dry objects while the bottom layer will easily fit up to 6 breast milk bottles along with a large ice pack. The top layer will also easily fit almost any kind of breast pump carry bag. This bag can also be used as a regular backpack when you aren’t storing breast milk. 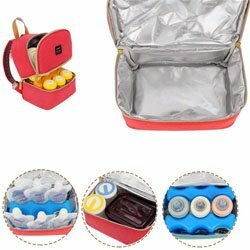 You can use it for shopping, as a lunch bag, and as a little traveler’s bag. When you do use it as a cooler bag for your breast milk bottles, you can rest assured that the insulation is going to keep them at the right temperature for hours on end. Go here to read other moms’ reviews of this product. This is another baby cooler bag with great design. 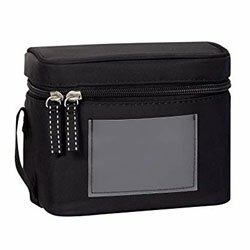 It looks pretty sleek and is the kind of cooler bag you can use as a normal bag and would be proud of carrying around as a mother. Apart from the design, there are lots of other things to love about this bag. For starters, it’s pretty tall and can be used to carry large bottles. It can carry two large breast milk bottles. You can either pack them warm or pack them cold along with the freezer pack that comes with the bag. In fact, this particular cooler bag is a bestseller in it’s the baby tote bag category (here’s the link), so you know it’s a popular choice. Apart from breast milk, this cooler bag can be used to carry snacks for kids as well as sippy cups and keep them chilled for hours, To help in the insulation department, it comes with a freezer pack and two-way zippers which give either single bottle access or double bottle access. Need a Cooler capable of keeping Baby Bottles chilled for longer? So there are baby bottle cooler bags in the market for the specific purpose of keeping your breast milk bottles cool. But these will only keep them cool for a few hours, and even the best will not go more than a day. What if you want your breast milk bottles to last longer? In that case, you can use a regular soft cooler to do the job. Perhaps in the case of baby bottles, you won’t put in too much ice to avoid freezing the baby bottles. But then again, surely there isn’t anything wrong with putting in a little ice. With some good ice packs, you get to benefit from the superb insulation capabilities of a mainstream soft cooler, and you could keep the baby bottle chilled for a longer time. AO Coolers is a great brand that makes some high-quality soft coolers. While these coolers are pricier than your average baby bottle cooler bag, they are versatile enough that you will use them for a lot more than just chilling baby bottles and they are likely to last longer. 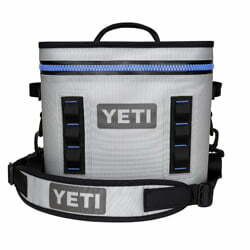 This particular soft cooler comes with a removable shoulder strap and a great durable construction. The insulation is quite thick while the liner is leak proof. When it comes to ice retention, this soft cooler definitely does better than your average baby bottle cooler bag. 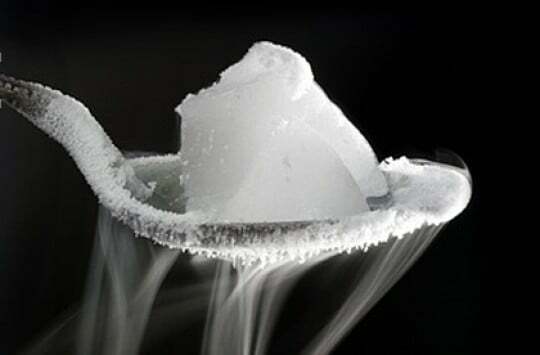 It will retain ice for up to 24 hours in conditions as hot as 120 degrees Fahrenheit. There are two available capacities: 12 cans and 24 cans, both of which should be more than enough for the average mommy. As for color options, there are many to choose from, and they are all quite stylish. 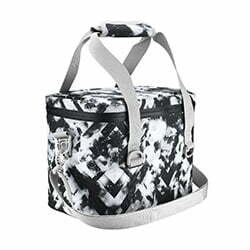 This soft cooler is perfect for picnics, sporting events, parties, and boat trips. When it comes to construction, the Homitt soft cooler has a very strong construction that’s guaranteed to last for years. The exterior is made of 840D TPU while the interior is made of 420D TPU. What that means, basically, is that you don’t have to worry about the material getting punctured or torn. The insulation foam is high-density foam and lies between the interior and exterior, keeping the contents of the soft cooler fresh and cold for hours. This soft cooler has a capacity of 10 cans and is designed with a lunch box shape. You can load it with anything from baby bottles to your favorite snacks when you’re out and about. It has padded hand straps if you would like to carry it by hand but also features a detachable shoulder strap if you want to carry it like a bag and free your hands up to carry other things. As a side note, Homitt also has a larger, 30-can cooler which we reviewed before and liked it a lot. 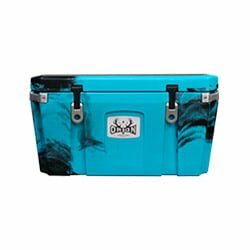 Yeti products are the crème de la crème of the cooler world and the Yeti Hopper Flip 8 is an excellent choice for those mommies and daddies who not only want to cool baby bottles but also want to spoil themselves with a Yeti soft cooler that they can use to carry other stuff and also make a fashion statement. The Yeti Hopper Flip 8 will carry up to 6 cans plus ice, which means it should also be able to carry baby bottles. It is also a great option for carrying some of the larger breast milk bottles without breaking a sweat. In terms of insulation, the Yeti Hopper has closed cell insulation, which offers superior insulation, retaining ice for way more than a day. The exterior is pretty strong, being resistant to tears, punctures, mildew, and UV rays. You can get baby coolers on the individual manufacturers’ websites as well as numerous online marketplaces. Our choice to make a purchase would be Amazon though. Amazon is a trusted online marketplace and offers numerous benefits for shoppers. 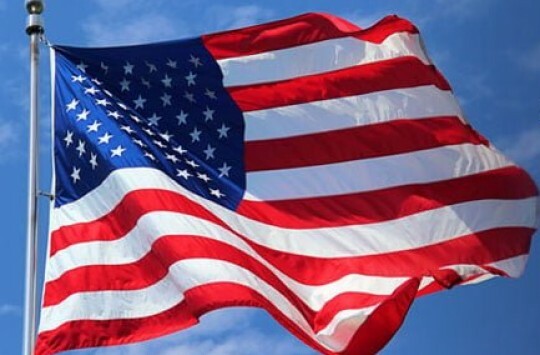 These include real reviews by other shoppers who have bought the products, buyer protection, which allows you to return products you are not happy with and get refunds, and other perks that come with being an Amazon Prime member, such as free shipping and one-day shipping. They even have a best-seller list for the baby bottle bags, updated many times a day. And that is it for our article on the best insulated baby bottle cooler bags. As you can see, you have plenty of options to choose from. Choose wisely and keep your baby’s milk at just the right temperature all the time. Keep your baby cool!